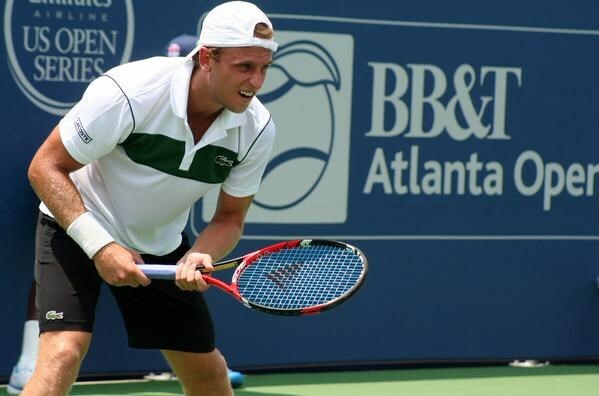 It may not have been the fourth round of Wimbledon, but Denis Kudla continued his high level of play this summer by defeating former top-40 Australian, Marinko Matosevic, in the BB&T Atlanta Open final round of qualifying on Monday at Atlantic Station. Kudla’s 7-5 6-2 victory over the unpredictable Australian puts him in the main draw of the ATP World Tour event and gives him a chance to improve on his world ranking on No. 94. The 22-year old from Maryland by way of Ukraine has had a busy summer. He won a Challenger event, reached the finals of another and then had his best ever Grand Slam result. Kudla’s serve is certainly one of the reasons for his success. He pounded out 10 aces against the talented Matosevic, and that should be a good sign for the American on the hardcourts this summer. That, along with a new coach and an improved mental state of mind is helping the talented right-hander close out matches against other talented players. That may start right here at the BB&T Atlanta Open. Another under-the-radar American was successful in the other early qualifying match on Monday. Floridian, Austin Krajicek, dismantled Japan’s Yuichi Sugita, 6-2 6-1, in under an hour. Krajicek didn’t drop a set in qualifying and nailed nine aces by converting on 69% of his first serves while only facing one break point. Krajicek is a “qualifying warrior” as he has advanced through the qualifying draw of four ATP World Tour events in 2015.